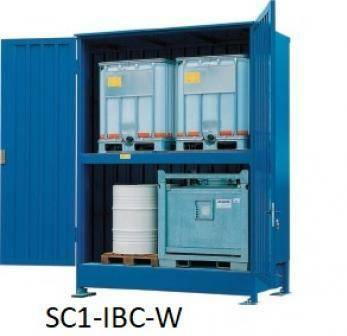 IBC storage cabinet with integral sump and wing doors, manufactured in accordance with PPG 26 regulations as per the requirement of the Environmental Agency. 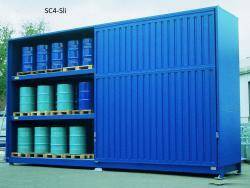 These cabinets are ideal for storing IBC's directly inside the container. Cleverly designed to maximise the internal storage space with minimal external space. Our range of cabinets are designed to accomodate upto 12 x 1000 Ltr IBC's . Varying sump capacities are available upto 4000 Litres. Space efficient sliding or hinged wing doors are fitted as standard. A massive 5 year guarantee is offered as standard for the workmanship of this unit so you have convenience and peace of mind with your storage product. A Static discharge / earthing point is available as an optional extra. All the cabinets are naturally ventilated. Prices shown are collection only . Call or email for a cranage quotation based on your geographical location.